Anthony Thomas Forsyth (Service Number 3/671) enlisted for the First World War with a Peterborough Street address. Anthony Thomas Forsyth, known as Tom, was born on the 19th of November 1892 at Rotherham in Canterbury. One of seven children, his father was Edinburgh born William and his mother Prussian born Elizabeth (maiden name Borkowski). William, Tom’s father, worked variously as a brewer and baker but eventually settled into farming at Marshlands.Elizabeth’s Polish/German father Thomas Borkowski also farmed at Marshlands, as did many other Polish immigrants from 1870s onwards. The Forsyth children went to Burwood School but around 1903 the family may have moved briefly to Mangatainoka in the Tararua District before returning toCanterbury. Tom’s parents separated when he was a teenager. William and Elizabeth entered into a protracted and acrimonious property and maintenance dispute. At one court hearing Tom’s sister Marion gave evidence “that most of the work on the farm was done by the children”. Tom’s early years seem to have included hard physical work and a degree of family dysfunction. By 1915 Tom was working as a carpenter and living in Mrs Elizabeth Wooler’s boarding house at 148 Peterborough Street. Aged 22, Tom had spent the previous four years as a territorial with the 6th Christchurch Medical Ambulance. He officially enlisted on the 20th of April 1915 and was assigned to the New Zealand Medical Corps. Tom’s Foreign Service began on the 12th of June 1915. He arrived in Suez on the 23rd of July but by September had been appointed to the position of cook and despatched via Southampton to the New Zealand General Hospital at Brockenhurst in Hampshire, England. Tom stayed at Brockenhurst until August 1916 when he relinquished his position as cook. He was transferred first to the New Zealand Stationary Hospital at Wisques in France and then to No. 2 New Zealand Field Ambulance. The Field Ambulance was a mobile medical unit, not a medical vehicle, stationed close to the front line to receive and collect the wounded or sick. Some casualties were treated and returned to duty but most soldiers were transferred to a dressing station for further treatment or to a clearing station for transportation to a field or military hospital. Being so close to the front brought its own risks and dangers, and first-hand experience of the noise, chaos and brutality of war. The medical staff were exposed to all the physical hardships of war as well as being tasked with bringing rescue and relief to frightened and stricken soldiers. In September 1916 Tom’s No. 2 New Zealand Field Ambulance was heavily involved at Flers on the Somme, a battle that saw the first use of tanks. Tom may have acted at times as a stretcher-bearer or orderly while in France but by May 1917 he was appointed as a cook to No. 2 New Zealand Field Ambulance. He briefly joined the Corps Main Dressing Station, where troops were further stabilised before being transferred to a clearing station or returned to duty. 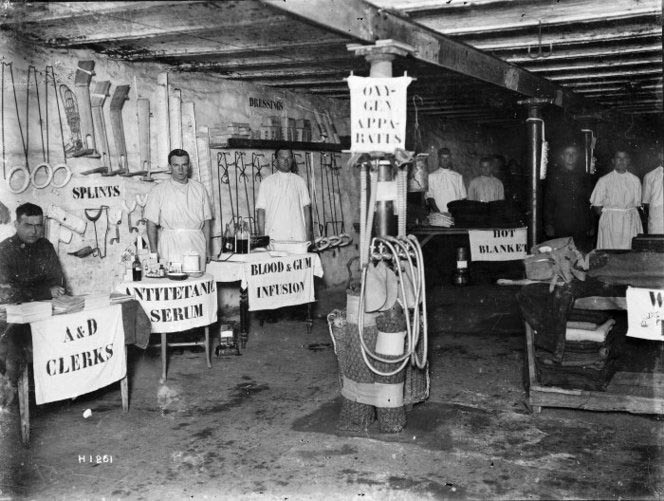 Conditions in the dressing stations were often rough and ready, existing buildings, dugouts or bunkers were used as stations, anything that could provide some protection from the elements and enemy fire. Horse drawn vehicles then took the wounded soldiers to the clearing station where they may be evacuated by train, motorised vehicles or even barges. Tom was promoted to Corporal in August 1918 and briefly attached to the Advanced Depot of Medical Stores before once again re-joining No. 2 New Zealand Field Ambulance. In November 1918 Tom was treated for influenza first at the 22ndGeneral Hospital at Camiers in France before then being transferred to Endell Street Hospital, London. Endell Hospital was notable as it was staffed entirely by women and run by suffragettes. He was in the same month transferred to the New Zealand convalescence hospital at Hornchurch in Essex. The war for Tom was over. Armistice Day, on the 11th of November 1918 had been declared prior to his illness and Tom could convalesce reassured he would soon be returning home. On the 3rd of December 1918 he left Liverpool on the Tahiti bound for New Zealand. The Tahiti gained some notoriety as the troopship carrying the 40th Reinforcements to England and caught up in the second wave of the flu epidemic that resulted in some 80 deaths. Tom arrived home safely on the 29th of January 1919 and was discharged on the 9th of February 1919. He received the 1914-15 Star, British War Medal and Victory Medal. Tom’s elder brother Albert William served with the New Zealand Rifle Brigade and like Tom was discharged inNew Zealand in 1919. The home front was not a peaceful place for either brother; the Forsyth family was still in conflict. Their mother Elizabeth had given up trying to extract maintenance money from their father William and had now turned her sights on her sons. Both Albert and Tom were pursued through the courts in May 1919 for maintenance by Elizabeth(as were their younger brothers while Albert and Tom were overseas). The court found in her favour but it was strongly hinted that the money was being spent on drink. Elizabeth was found dead under her bed on the 1st of October 1920. She died alone and still estranged from her family. Her son Andrew Forsyth at her inquest stated she had “not lived with her husband and family for 14 years. The last time he had seen her alive was in March”. The post-mortem showed she died of heart failure due to double pneumonia together with cirrhosis of the liver and other signs of alcoholism. On a happier note Tom married Florence Annie Wooler known as Flossie in 1919. She was the daughter of his former landlady at 148 Peterborough Street. Together they had three daughters Barbara, Carol and Alison. Tom returned to his work as a carpenter and later moved into demolition contracting. Flossie died in 1961 aged 70 and Tom in 1984 aged 92. They are buried at Ruru Lawn Cemetery.